Adjustment of colour temperature for lights with DALI Device Type 8 for Tunable White according to IEC 62386-209. DALI power supply for 18 DALI devices. 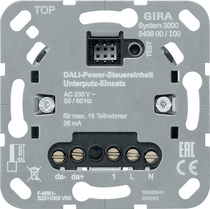 Parallel connection of up to 4 DALI Power control units to supply up to 72 DALI devices. Save the minimum brightness, the coolest and warmest colour temperature. Switch on with the last brightness/colour temperature set, or a saved brightness/colour temperature.